You need to be more specific with what readings you got on what wires. The ac voltage reading range on lead B from the opti is 1-4v,. On 94s and up you must use a scan tool to get codes. No codes can be flashed. I would check your opti harness connections for corrosion before taking the whole thing off. Which one of the wires has no pulse is critical. 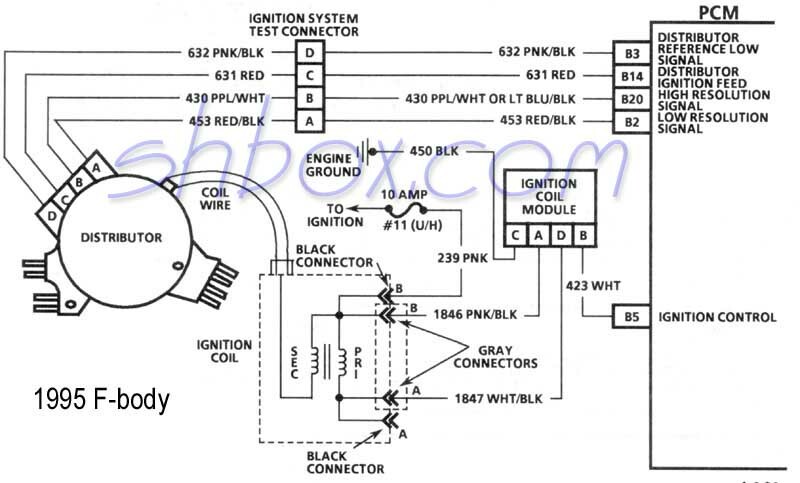 The engine will start and run with no high resolution pulse (pin B). It will NOT start with no low resolution pulse (pin A). With no high resolution pulse, the PCM shuts down the fuel system and ignition. It can’t time the pulse on the white wire to the ICM unless it knows the crankshaft position, and it gets that with the low res pulse. Sounds like no low res pulse, but you need to confirm that with the wire color. Last edited by Injuneer; 01-24-2019 at 03:34 PM. A '94 is OBDI. The codes can not be flashed. Need to find someone with an OBDI scan tool/code reader. I don't understand why you will not listen to or answer questions from the two most experienced guys here. Is this some kind of joke? The output of the optical cam sensor module in the Opti is a 0 to 5 volt square wave. With the 360 tiny slots on the high res part of the wheel, an average voltage of 2.4 on a DC meter is reasonable. But the low res portion of the wheel only has 8 variable length slots, so the voltage will be lower. But if the reading stays at 5 volts, the low res part of the optical sensor is not working. Simple check - when you are cranking the engine with the starter, does the tach needle move upwards a couple hunder RPM? The optical pickup module is inside the distributor, and it seems near impossible to find as a replacement part, hence one option is buying a new, decent quality (read - not an ebay or parts store cheapie) Optispark. I believe their is now someone who rebuilds the units, and has a good track record. If you need a replacement, you should look for that source. Otherwise, most of the replacement Opti's available are not good quality, and that included the expensive MSD. The battery has not been disconnected sense it went down.. ili' check for that code in the morning. I have heard about these aftermarket optispark dist. Being junk. I have found the pick up's for sale online. Corvette site has them. I'll post the site. got it wrote down in one of my books. Optispark was rusty inside..... can't believe it's so bad inside, Bit the bullet and bought a new one from Brad on eBay, worth the extra, to know it's going to work. Be nice to have it running again. Car won't start, PCM Dead? ?